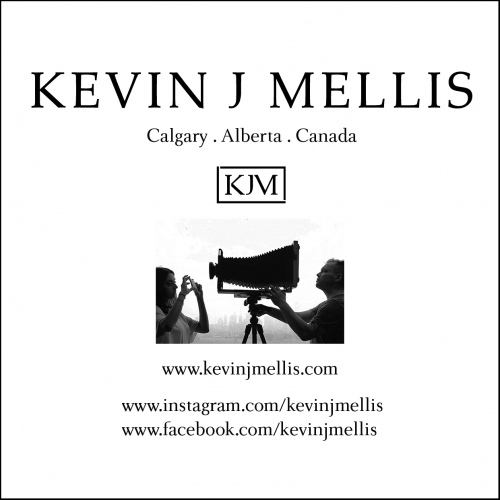 Kevin J Mellis was born and raised in the relatively small town of Thunder Bay, Ontario, Canada. He moved away in 1996 and now resides in Calgary, Alberta, Canada. He is the third son of Beth and Ian Mellis. Beth was a nurse and Ian (deceased in 2006) was a teacher. His trajectory to become one of Canada’s very few recognized Large Format artists did not occur like many traditional photographers with a darkroom in his parent’s basement. He first started working in the human services field in 1992, working with young people who found themselves entangled in the criminal justice system. He has since shifted from that area of work and is now working with people in the Canadian Health Care system as a Medical Social Worker. He currently works in Alberta’s largest trauma centre on their Critical Care Team working in the Emergency Department. In 2009, he witnessed the very unfortunate death of a four-year-old child in the department that ultimately shifted his world perspective. In response to this very challenging situation, he proactively decided to pick up a digital camera as a therapeutic means of escape. Before this incident, he was unfamiliar with the process of capturing images. He has since finished his diploma from the Vancouver Institute of Media Arts in March 2012 and his Masters in Fine Art from the University of Calgary in September 2015. His final thesis (published) was entitled “My Extended Family.” He decided to shift his artistic focus from a digital process to an analogue Large Format Photography process in late 2013. His sole artistic intention is to slow his mind down, which in turn allows him to engage with his subject matter on a much deeper level. His overall goal of creating images as an art-form is to disseminate his work with the overall outcome of encouraging the viewer to think critically about the immediate world around them.